After some time of work, here you have the publicity of the first Spanish International Tournament. The Aragoness Jugger Asociation is preparing the International Zaragoza Tournament, which will take place in Leciñena (a town 20min away from Zaragoza) during the 2nd and 3th of April. The Registration fee will be 5 € per person, and each team has to bring his own equipation. The Tournament itself will be played the 2nd and part of the 3th of April (Saturday and Sunday) in the Football Field of Leciñena. There is a Sports Hall/Pabillion where we can sleep (and play the Tournamente in case of bad weather) for free, however anybody willing to pay de Hostel-like stablishment will be able to sleep in a warm bed XD. Any doubts, questions or even sugestions you have, please feel free to share them with me (if you prefer in English; no german sorry) and we'll see what we can do. Hope we can see you in the field. 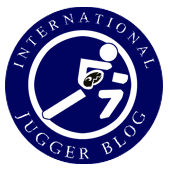 Ten months ago we heard about Jugger in a meeting in Spain. If you see youtube videos it’s not exactly Jugger, but it was enough for us to start searching about the game. We found a Jugger German rules in the Spanish wikipedia, and we look for somebody who could translate it. Two workmates (Frederike Hoff and Frederic Yvan Lapuente) help us with the translation. We didn’t get all the rules translated, but enough to start playing. We had been playing combat with foam swords for some years, but only combat. First time we played Jugger it looked more hokey than jugger, but we like it very much. We add Jugger to training sessions every Sunday we get enough people to play. On November we organize a meeting to play softcombat (is how we call here the combat with foam swords), Mölkky, and things like this. For this meeting we make some Pompfes following german rules (until then we had played Jugger with our normal foam weapons) to show the people what was Jugger. Then we started to speak to organize a Jugger Tournament, but we needed all the Jugger rules, so I contacted with Ruben and Lester (thank you very much for the help), who gave me all the information we needed to start playing. We don’t have teams, we are only 15 friends who go park to play, but we are starting with official rules, we will organize a tournament when we have people enough, and I hope we will be in 2010 in Berlin for the II Open. Now we have just open a forum (juggeforo.260mb.com) to contact with more people in Spain and to prepare jugger activities and we are working with Ruben to have an up-to-date rules in Spanish. I hope you will hear more about us early.